Cowboys and Indians. Toys and Play Sets. 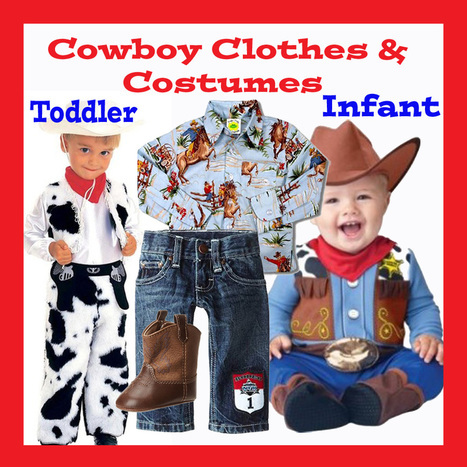 Toy guns, toy rifle and cap pistols with holsters Bow and arrow set and dress up play outfit. At some time in our lives most of us have played Cowboys and Indians. For me, those are fond memories of simpler times when a kid could use their imagination and take on the role of one side or the other and have a good time. We had plastic sets of cowboys, indians and army men that we could play with outside in the dirt or in the house. The plastic toys are easy to throw in the kitchen sink and spray them off after they have been in the dirt. Spread out a kitchen towel on the cabinet and let them dry and they are nice and clean for playing in the house. I just wanted to mention that, these plastic toys have overall good ratings, but in a couple of customer reviews, it was mentioned that "they don't make them like they used to" . I guess that is true with a lot of things, so they are what they are now and these are the best of what is available. You will also find sets made of wood and from familiar brands like Playmobil and Lego along with toy guns and bow and arrow sets. This is a 130 piece set that comes with 2 inch Cowboys and Indians in different poses. 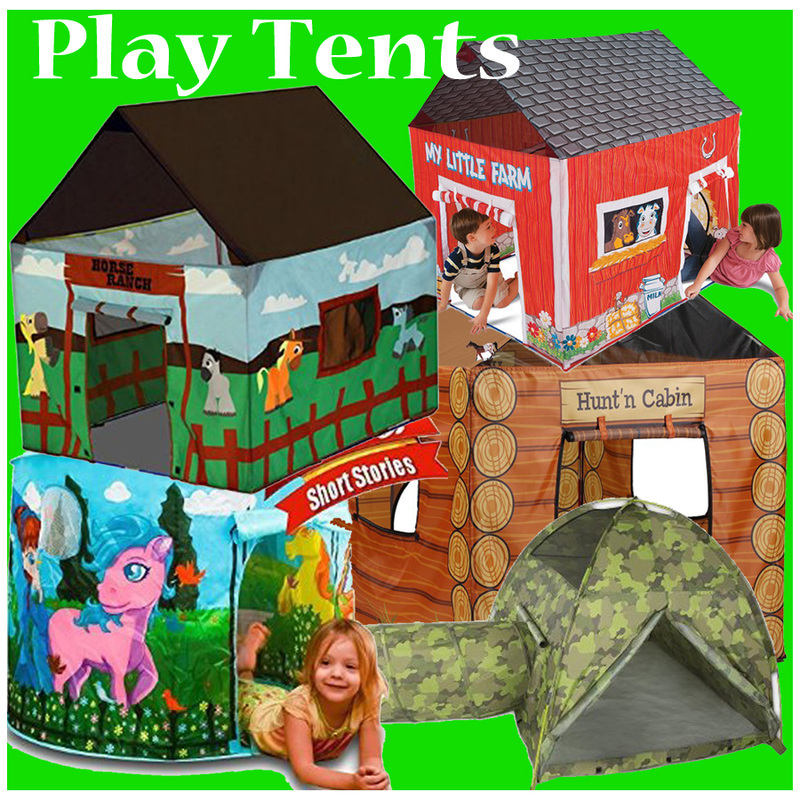 Set them up with the horses, fences, tee-pee, wagon and canoe that also comes with this set. The toy figures in this set are 2 1/4 inches tall. There are 108 pieces all together that include 2 covered wagons, 2 tee-pees, totem pole, canoe, cactus and a play mat. It comes in a clear plastic bucket with a handle. Here is another classic set that has 92 pieces. It includes Cowboys, Native American figures, horses, tee-pees, fences, cactus, canoes and wagons. The figures stand 2 1/4 inches tall. Western theme toys from Safari Ltd are and painted authentic looking figurines. They come in a clear plastic tube that is easy to take along. These will really look good along beside a train set or use them for school project displays. ​This is a collection of pioneer cowboys, Native Americans, covered wagon and other wild west figures. These are Powhatan Indian figures. There are 12 total pieces that include a woman with a baby, Pocahontas, woman cooking, Wahonsonacock, a warrior, hunter with bow, deer hide, canoe, fox, deer, bear and a fire pit. Playmobil has a nice Native American Camp Set. The figures can bend, sit, stand and turn their head. There is also one that can sit on the horse. It includes 3 figures with accessories shown. 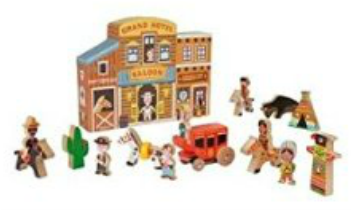 There are other wild west sets from Playmobile that I feature in my Playmobile Toys page. Thick wooden toys are easy for little hands to play with and set up. This set has 15 pieces of Cowboys, Indians and accessories. 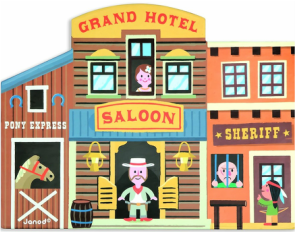 The story box is designed to look like an old west town and sets the background for the characters. ​It also comes with a cactus, wagon, horses, cowboys, Indians, teepee, totem pole and even a bull. I don't know of a more famous pair of Cowboys and Indians than The Lone Ranger and Tonto. They have saved the day many times in scenes from their old black and white TV show and now in the movie. They are an unlikely pair who both work on the good side of law and order in the west. 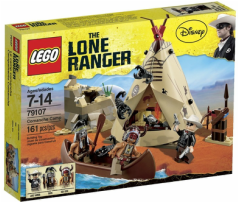 If you just want to add to an existing Lego set, The Lone Ranger and Tonto do come separately. ​This set includes 5 mini figures including The Lone Ranger, Tonto, Red Harrington and the 2 bandits, Jesus and Barret with weapons and accessories. Also included is the stage coach with horses a horse for the bandit and more. 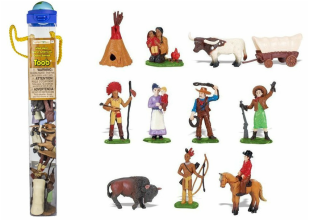 The Comanche Camp set has 3 toy figures, The Lone Ranger, Tonto, and Red Knee. There is a tee-pee that stands over 6 inches tall with a removable canopy. A canoe and other accessories are also included. I have selected the best rated toy guns that are available. You will find a toy rifle, toy shotgun and toy pistol. Kids can have a big time playing Cowboys and Indians and stage their own western scenes. These are great to use for western costumes. 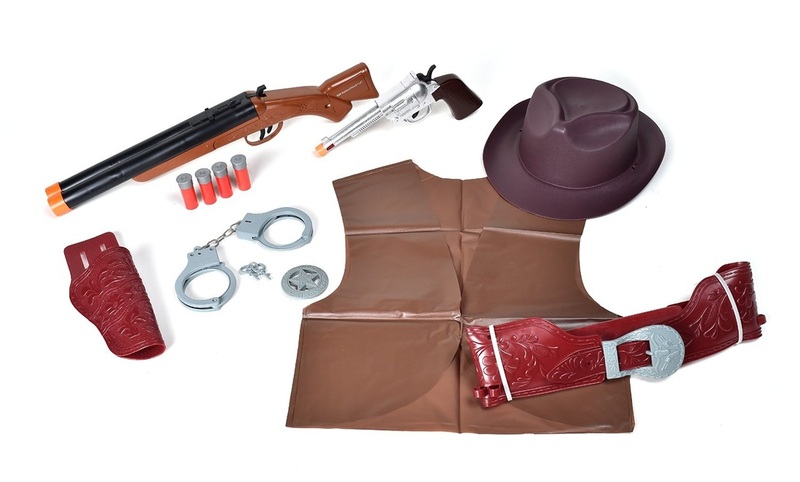 This Wild West Ranger and Bandit Play Set comes with guns and holsters, a mask, handcuffs, keys, a badge and suction cup darts. Kids can add a bandana tied around their face for that wild west bank robber look. 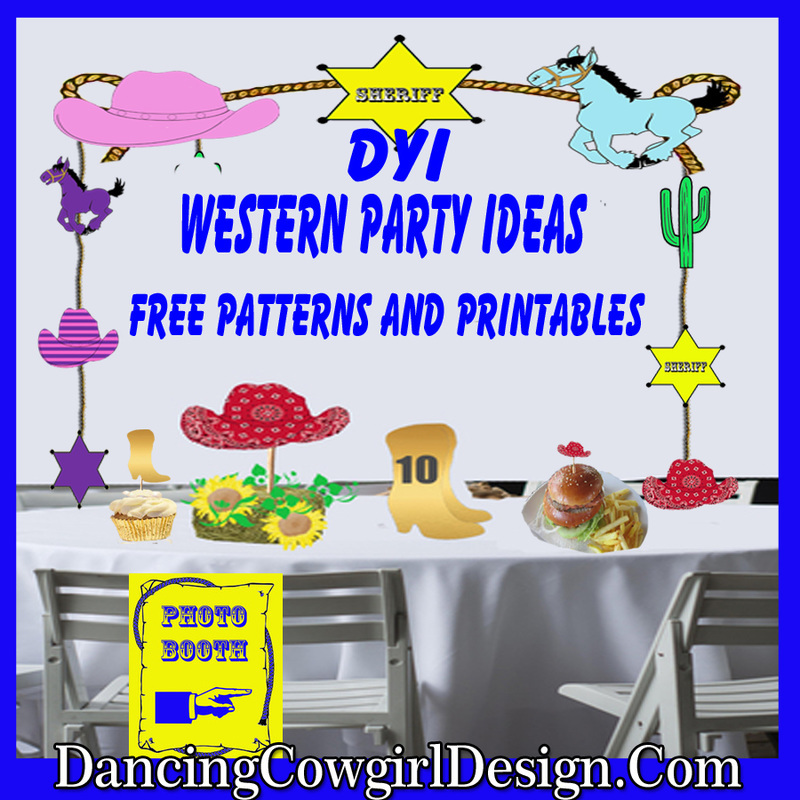 This western dress up set is well rated by previous customers. It is a 13 piece set that comes with electronic toy shotgun that ejects shells and a light and sound toy western pistol. A hat, vest, belt, holster, badge and handcuffs are also included. 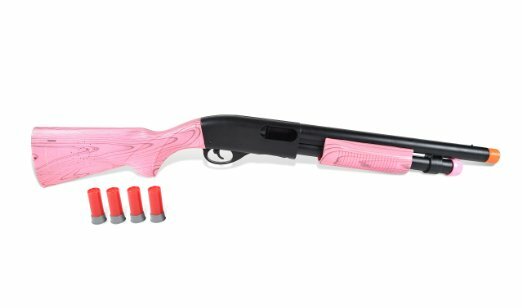 Maxx Action has the best rated rifle and shot guns and even a pink one if you like. This is an electronic gun with sound effects and includes five play cartridges. It has realistic loading action, ejecting shells and realistic wood grain deco. It comes with the batteries included. The shotgun is also electronic and makes gun sounds. It includes 4 play cartridges with realistic loading action. 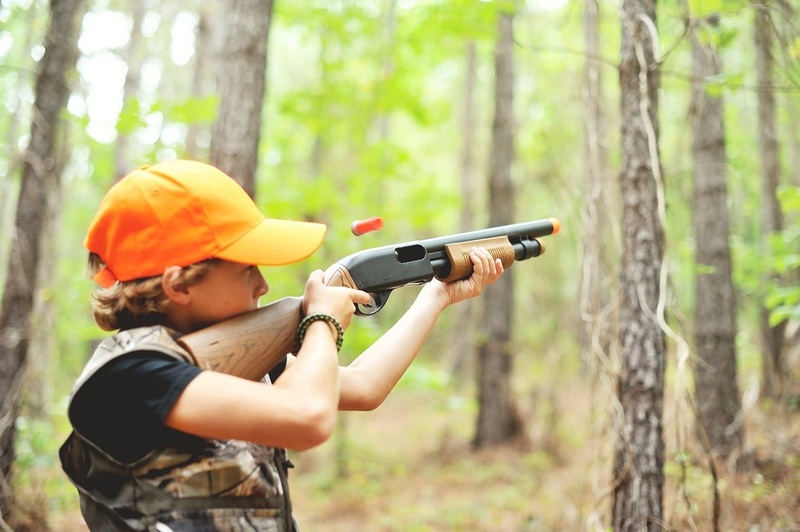 ​The Team USA pop gun has a wooden handle, automatically reloads and pops every time. This is a good toy for all ages. There are a couple of good cap guns available. One uses the roll type caps and the others use the ring style. Don't forget to grab some caps that fit the gun you might choose because neither of them come with caps. This toy cap gun is constructed of die-cast metal and has a plastic wood grain look grip. It uses roll caps but the are NOT included. The Billy he Kid Cap gun is made of die cast metal and is 11 inches long. It uses the ring style caps, but they are NOT included. 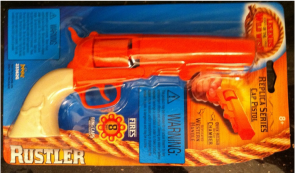 Toy guns now have an orange tip on the end of the barrel to indicate that it is a toy, but this one is orange all over except for the grip. The chamber inside is made of die cast metal. It uses the ring style caps and they are Not included on this one either. Of course I would not suggest shooting arrows at anyone, but for playing Cowboys And Indians, I guess a bow and arrow set with rubber suction tips on the arrows would be fun to shoot at targets. This is a 34 inch fiberglass bow set that comes with 2- 12 inch arrows. The arrows do have rubber safety tips. There is a 4 color target also included. ​Here is a set that is sized for children 3 years and up. The bow is 23 inches long. There are 4 arrows and a quiver to hold them. It also includes a target. 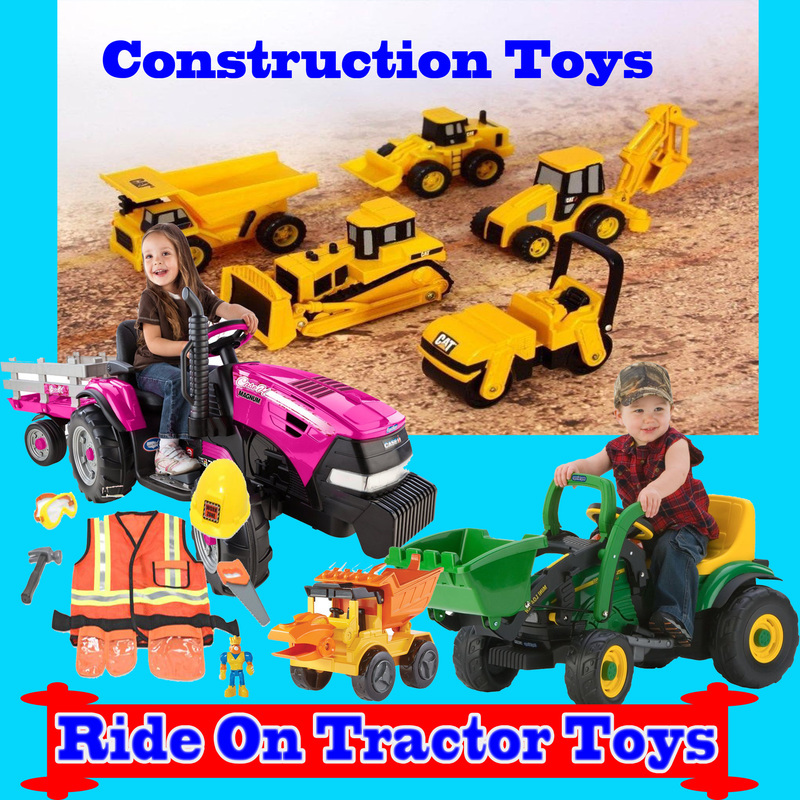 Visit the main toy page for the best western, rodeo and horse toys.